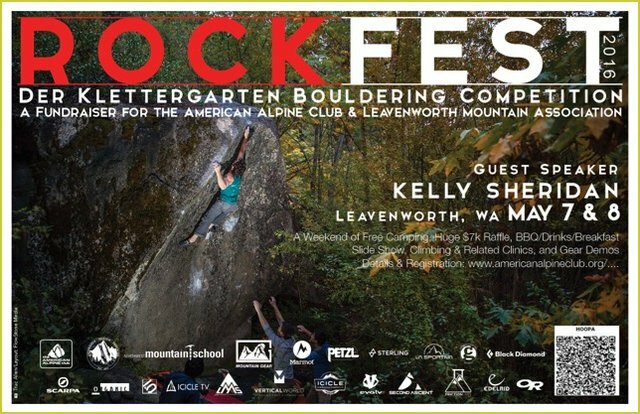 Join us May 7, 2016 for the seventeenth annual Rockfest Climbing Festival in Leavenworth, WA. Jump into the bouldering comp, take a clinic, or climb on your own and then come eat, camp, and party at Fromm's field Saturday night. Kelly Sheridan, author of Leavenworth Bouldering, will be the guest speaker! Kelly Sheridan Slideshow: Kelly has a long association with the Leavenworth bouldering scene and is the author of the past two guidebooks to bouldering around Leavenworth. He will share stories surrounding the evolution of bouldering in the area and the development of his latest guidebook. Slideshow starts at 8:30 pm Saturday with the opportunity to meet Kelly at the party before. Camping at Fromm's Field & BBQ: The AAC has reserved Fromm's Field in Leavenworth for the weekend and participants are invited to camp, eat, and relax at this amazing meadow along the river just off Icicle Road. Petzl, Black Diamond and Mountain Gear will once again be providing dinner and breakfast to all festival participants. Friday night Update! If you are looking for a place to camp Friday night you can go to Fromm's and pay the owner $6 for Friday. Getting to Fromm's Field: This is located at the end of Wilson Street off of Icicle Road. To get there from US Highway 2, follow Icicle Road 1.1 miles from US Highway 2 and then turn left (East) onto Wilson Street and follow it to the very end of the road and the entrance to Fromm's. All proceeds from Rockfest go to support the American Alpine Club. Sponsors cover all costs of food, clinics, and the bouldering comp. $10 buys you dinner, breakfast, and beverages. $35 to take a climbing clinic, which includes dinner, breakfast, and beverages. 8:00-8:45 am: Check-in for morning clinics and/or bouldering competition by the US Forest Service kiosk in the parking area behind Barney's Rubble. All morning clinics will start promptly at 9:00 am, so arrive early to make sure you have time to register, pack, and get oriented. 9 am - noon: Morning Clinics will take place within walking distance of the parking area. 4 pm - 6 pm: Climber pre-funk at Fromm's Field. Beverages included in your rockfest, clinic, or bouldering competition fee. 7 - 8:30 pm: Raffle, climbing games, socializing. 8 am - 11am: Pack up and head out for a day of climbing and Rockfest close.